Here's another fun freebie for you all today. 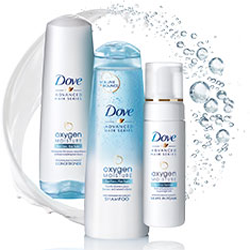 Get a FREE sample of Dove Oxygen Moisture Hair Care! Simply click here, fill out the form and with 4-6 weeks, your sample should arrive. I just requested mine and I can't wait to get it! Enjoy.